In 1936 the Swiss émigré, designer and photographer Herbert Matter arrived in New York. 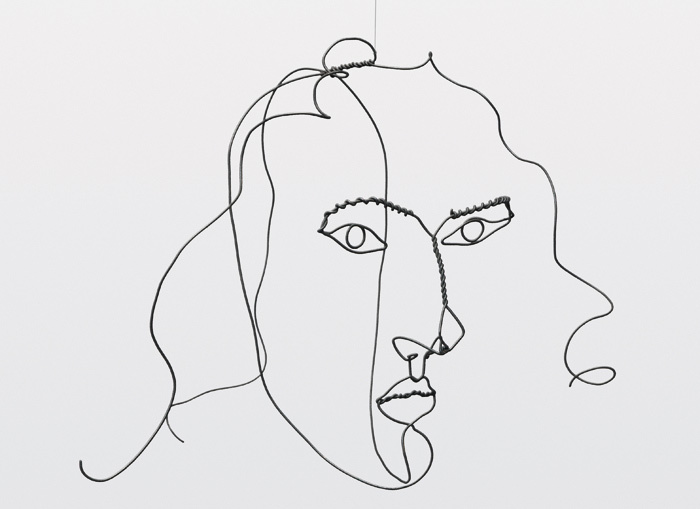 He developed a friendship with Alexander Calder, who invited him into the storefront studio he occupied, near his apartment on East 86th Street. By this time, Calder had become known in transatlantic art circles for his pioneering sculptures, embracing both movement and abstraction. Matter's response to these works is documented by the extraordinary body of photographs he created in Calder's studios as the sculptor prepared for his exhibitions at the Pierre Matisse Gallery in the late Thirties, and in his pictures of the resulting exhibition installations. In a similar manner to the photographs of Picasso's studio created by Brassaï in the Thirties and Forties, Matter's and Calder's images play with the use of dramatic lighting effects, heightening the surrealist atmosphere. A photograph from the Pierre Matisse Gallery in 1937 shows Starfish (1934) - a hanging piece with three simple, carved wooden elements - set into the corner of the room and lit by a strong directional spotlight, causing the three elements to cast dark shadows against the wall. The starfish-shaped carving, which hangs low to the ground and is allowed to spin, is balanced by an anthropomorphic figure with a simple head and tail, hanging, at a much higher level, from a trapeze-like crossbar. The figure recalls the acrobats that so enthralled Calder on his visits to the circus in the mid-Twenties and which inspired his famous Cirque Calder (1926-31). 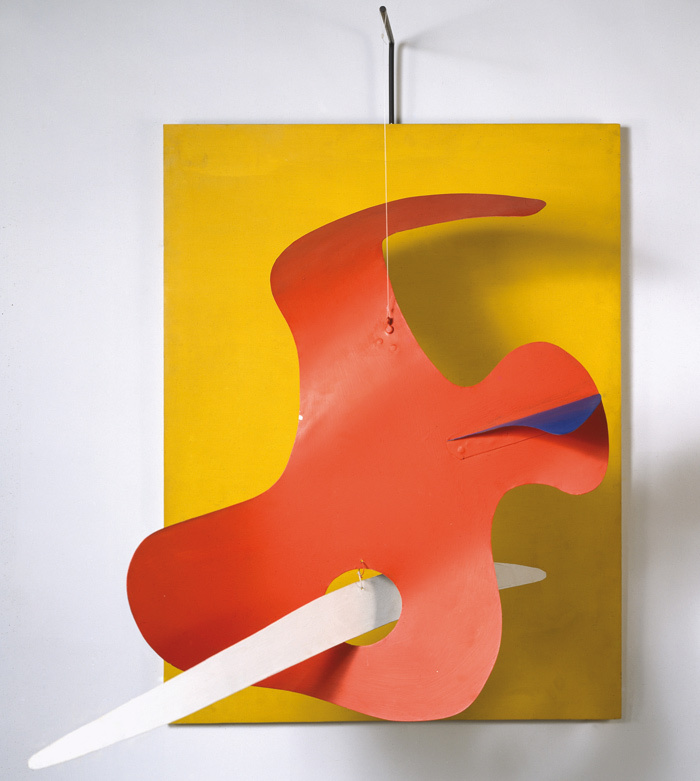 As with other photographs that Matter made of Calder's works - sculptures such as Tightrope (1936) and The Brass Family (1929), which make more direct reference to the circus - the image of Starfish captures the drama and tension of the performance, which Calder was able to distil and translate into sculptural form. As the artist stated: 'There's another thing I like. That's the spotlight that concentrates on a certain area of the circus... There was a performer, Lillian Leitzel; she would come out with the light all on her, and then she did a hundred flops hanging by her wrist from a wire. There was a tall man who stood by her and held her red cape. What I loved was the spotlight on her and the rest in obscurity...I've always been delighted by the way things are hooked together...It's just like a diagram of force. I love the mechanics of the thing - and the vast space - and the spotlight.' In other photographs, Matter's lens focuses on corners of Calder's studio in which works are stored together, creating a tangle of wires that only those very familiar with his body of work could separate out into component parts and pieces. 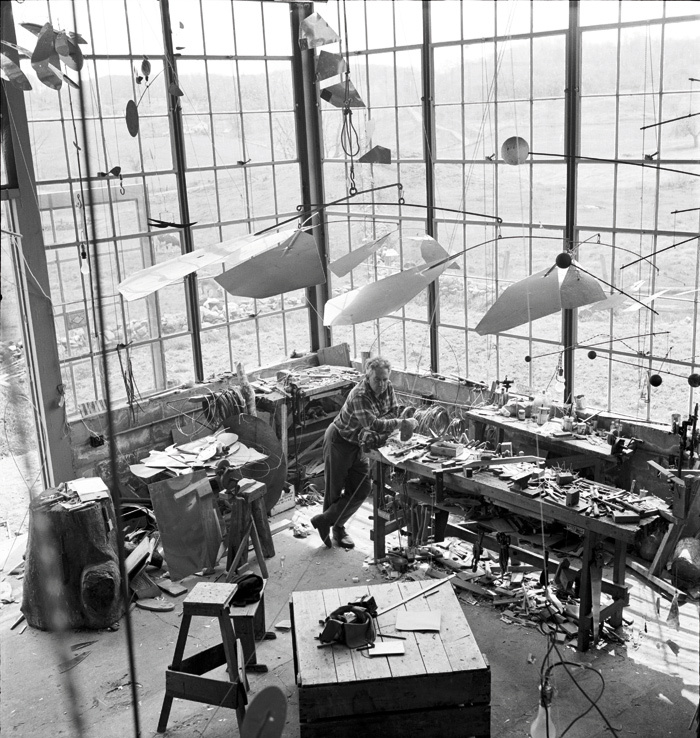 At his large studio in Roxbury, Connecticut, Calder created a pulley system, making use of the cavernous space and full-height windows to hoist his larger mobiles up above the workshop floor. There was a very practical character to this system, with Calder able to lower particular mobiles as and when he needed them, despite the apparent clutter. Looking down, from the vantage point of the mobiles, Matter's photographs of the Roxbury studio capture the tangle of wires and the creative chaos below, as well as the view out through the windows to the rural landscape beyond. A drawing from 1925 shows Calder's early interest in the system of cables, anchors and guy ropes, visible in the gloom above the spotlights, at the circus tents he visited as a young artist. 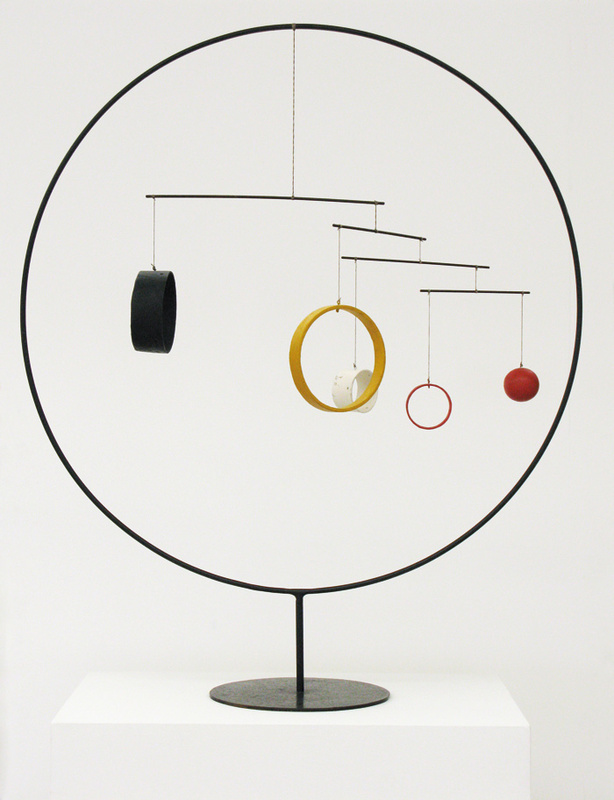 Combined with his training in engineering, this interest in the mechanics of the circus - the literal staging of the spectacle - clearly influenced the construction of Calder's mobiles and other complex, balanced pieces, but it may also have played a part in the way the artist saw the relationships between his works as they were placed in the spaces of the gallery and studio, and in other contexts. 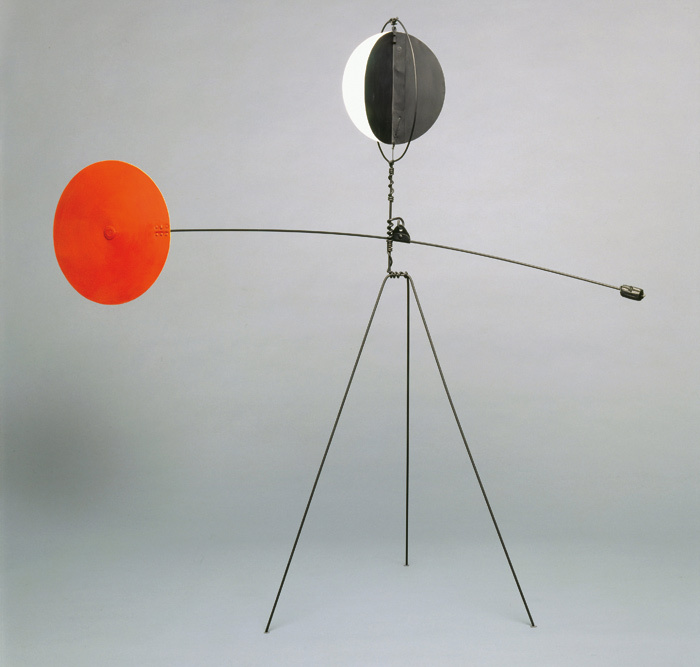 In 1934 Calder wrote to art collector Albert E Gallatin, describing himself as an 'illuminating engineer'. 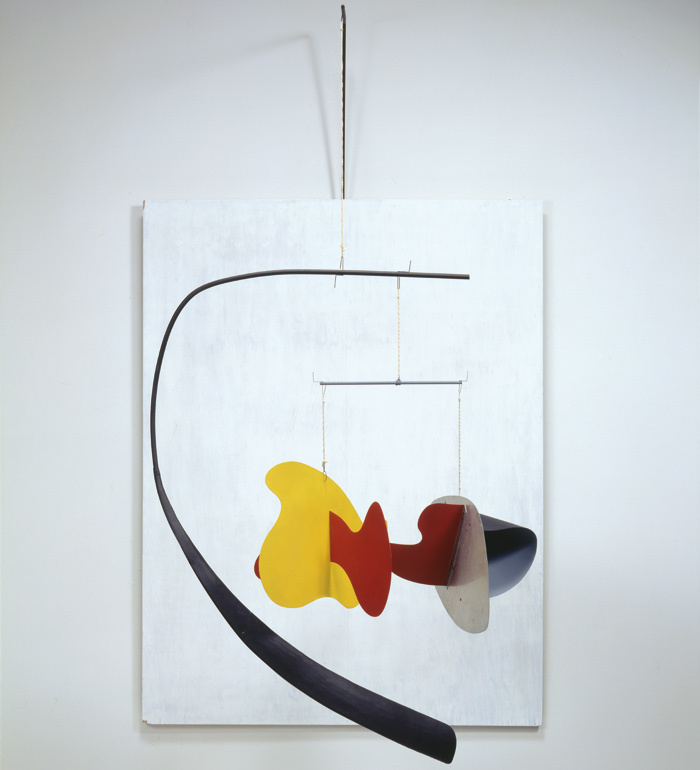 The dramatic spotlighting captured in Matter's studio photographs was also employed in Calder's 1937 exhibition in London at The Mayor Gallery. 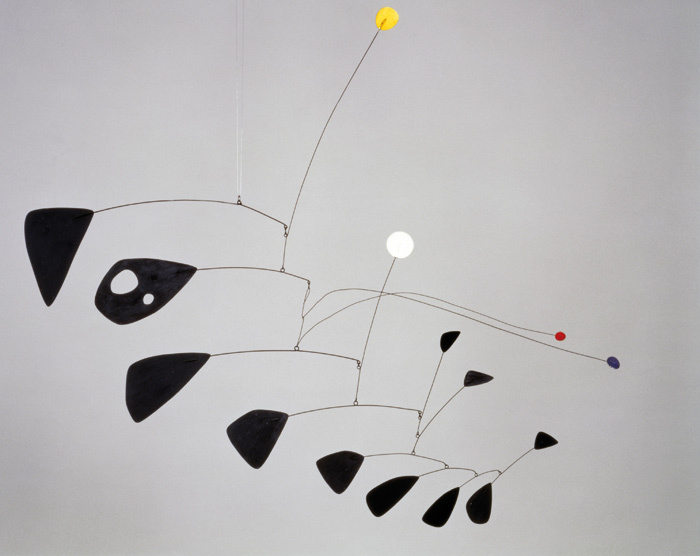 Calder described this in retrospect: 'We darkened the room... and used a spotlight for dramatic effect. The light cast shadows on the wall, and for the first time I became aware of their value.' In 1943, dramatic lighting was again employed in the presentation of Calder's work, when Matter was invited to act as consultant on the installation of Calder's retrospective (curated by James Johnson Sweeney, in collaboration with Marcel Duchamp) at the Museum of Modern Art, New York. Photographs documenting the exhibition show the works spotlit, so that they throw shadows on to the walls. Dark-painted walls and sections of walls form backdrops for groups of lighter coloured or delicate mobiles and floor-based pieces. Making use of the capacity for mise-en-scène within the enclosed exhibition space, the installation emphasised the theatricality of the sculptures, presenting them as performers moving in real-time before a collective audience. 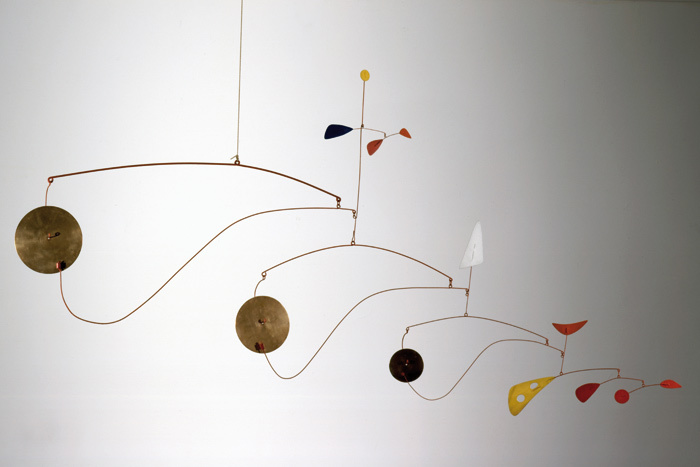 A later exhibition (1950 - 51) at the Massachusetts Institute of Technology presented a densely spaced selection of Calder's mobiles and floor-based works in a large, open gallery with floor-to-ceiling windows letting in natural light - an approach that stands in contrast to the carefully constructed backdrops and dramatic spotlighting at MoMA. Installation photographs looking down the length of the gallery show how difficult it is for the eye to separate the wires and component parts of each individual sculpture when they are shown together in this way. The photographs also show a large portion of the gallery ceiling with its lights and vents, to which the eye would be drawn when looking up at mobiles overhead. In the exhibition catalogue for the 1943 MoMA retrospective - Alexander Calder: Sculptures and Constructions - which included graphic design and photographs by Matter, one page shows a set of six 'spirit photographs'. These are studies of a mobile (Untitled 1936), lit up against a dark background and then set into motion so that each picture - created at a slow shutter speed and using stroboscopic lighting - records the arcs, spirals and wobbles described by the sculpture's eight branches and discs. Matter's photographs from 1936 to 1950, published together in book form in 2013, seem to articulate for later generations of curators and scholars the problems of presenting Calder's works from this period: how to show the range of motion inherent in the mobiles and mechanical pieces when the means to do so directly may not always be available (due to their fragility or the need to protect works shown in an exhibition context); whether to make use of the drama and shadow-play that fascinated Matter and which he exaggerated through his use of photographic lighting equipment; equally, how to do justice to the flat planes, simple shapes and bold colours that so clearly link Calder's work to a particular history of abstract modernist art; how to tease apart the mess of wires that were prevalent in Calder's working spaces; how to enable the viewer to see these delicately balanced works against their various settings and backgrounds (and in relation to each other), yet isolate and offset the unique elements of an individual piece. Matter's photographs and designs have set some precedents, in terms of the way we view and display Calder's sculptures that curators have been grappling with ever since. Matter designed the exhibition catalogue for Calder's 1964 retrospective at the Solomon R Guggenheim Museum, New York. Installation shots from that exhibition show the large-scale mobile The Ghost (1964) hanging in the central gallery space created by the museum's famous spiralling ramp. An unusual set of photographs taken during this exhibition by photographer Larry Fink show a group of children exploring and interacting with certain sculptures. The children can be seen blowing on the mobiles to prompt them to rotate, or peering through and around sculptures - kneeling and crouching and pressing their bodies against them. Similarly, pictures from the Stedelijk Museum, Amsterdam, in 1959 - when the exhibition Alexander Calder, Stabilen, Mobilen was held - show groups of people reaching up to gently touch a mobile. These photographs remind us that many of Calder's sculptures - from the wire works onwards - were originally intended to be set in motion by the air currents created by passers-by or even by the viewer's gentle touch. Fried's essay was prompted by the minimalist sculptors' turn towards a phenomenological encounter with sculpture, which invites the viewer to consider their relation to the work, the surrounding space, and the movement and placement of their own body. With hindsight, his argument reads as a last-ditch attempt to adhere to high modernist principles and to deny an overwhelming shift in art, throughout the 20th century, towards temporality, theatricality and interaction with the viewer. 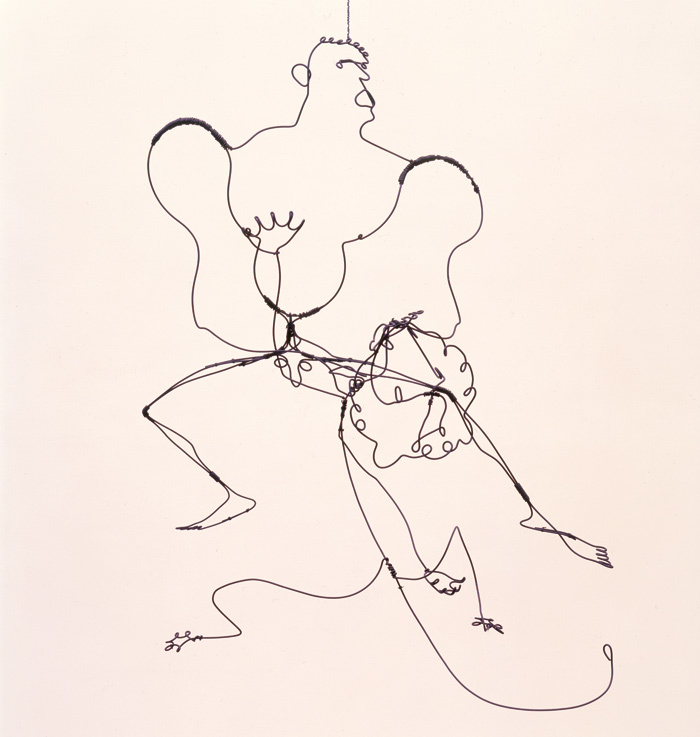 In describing the mobiles as 'a kind of actor' (or, by extension, a kind of dancer), Krauss echoes Calder's own description of his works as a form of mechanical ballet of parts (he even referred to specific works as 'ballet objects'), and her point has been taken up by those writing on Calder's works more recently, who have revisited his lifelong desire to stage a drama, or ballet, of moving, sculptural, plastic elements, which culminated in the production of the film Work in Progress in 1968. 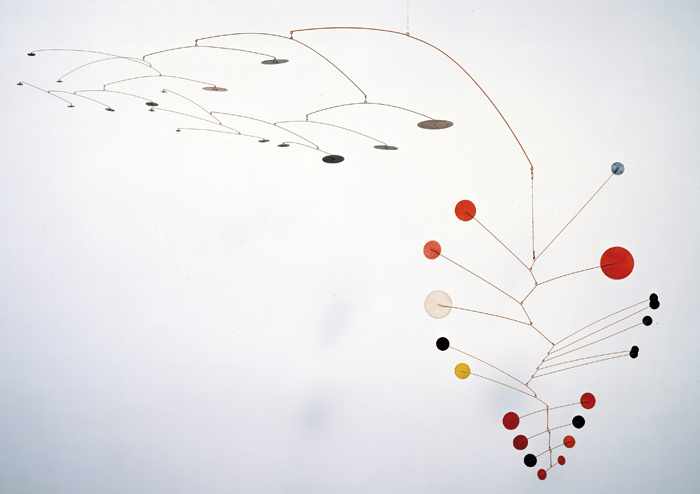 If Calder's mobiles and mechanical sculptures locate their meaning as actors (or dancers), the importance of 'staging' them or articulating them in relation to one another within the exhibition context therefore becomes all the more pertinent. 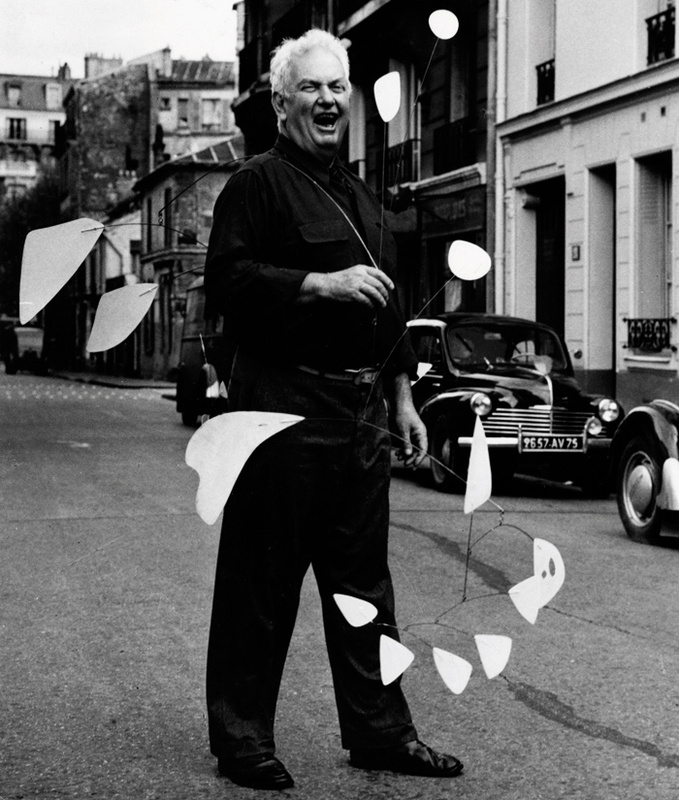 In his lifetime, Calder collaborated with others on the design of his exhibitions and on several theatrical productions -- composing motions and expanding the definition and context in which sculpture may be seen and encountered. 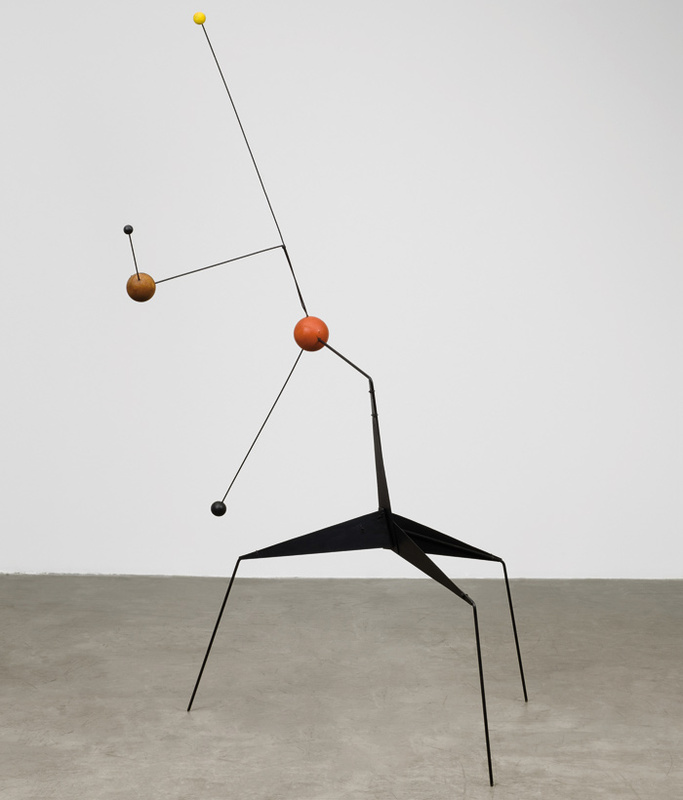 The challenge for curators of Calder exhibitions is to present his 'performing sculptures' in such a way as to explore his interest in movement and theatricality, while protecting the often-fragile works. Many and varied attempts have been made in recent exhibitions to revisit Calder's sculpture in terms of its theatricality. Exhibition designs have employed specially constructed architectural features to frame and isolate the sculptures; or have employed dramatic lighting, or mirrored plinths, to heighten a sense of drama. 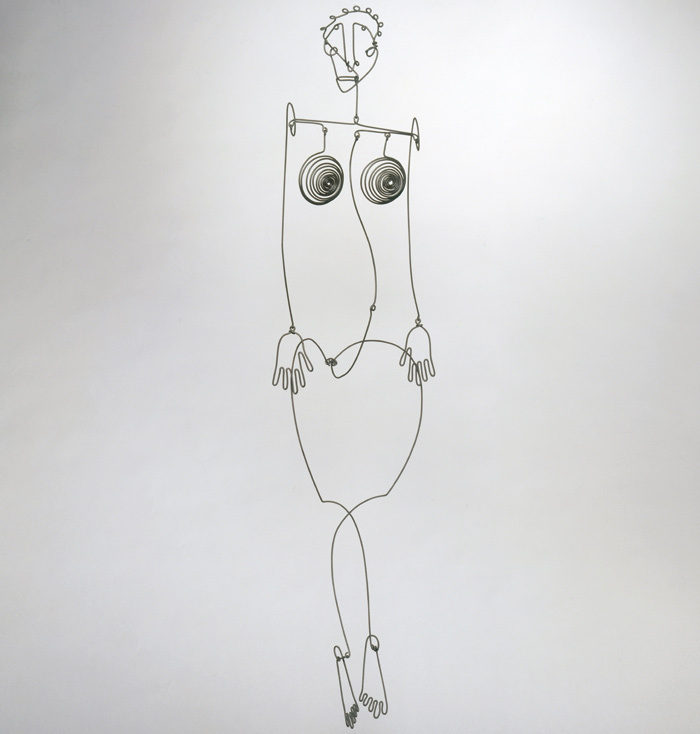 Many of Calder's sculptures, particularly the mobiles, seem to ask of the viewer that they slow down in order to fully appreciate the range of motion. 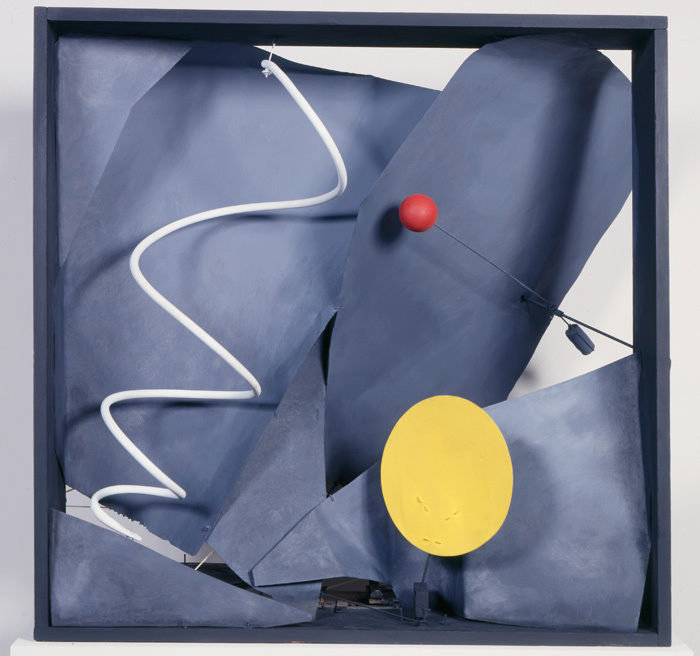 Calder's works do benefit from being seen both in isolation and in interesting juxtapositions, just as the elements within them describe a range of shifting motions within complex compositions. The question is always how to isolate each work, or each part, yet see them in relation to each other and their context: how to simulate the 'spotlight' that highlights certain 'acts' and throws others into temporary darkness. As much as he spoke of gentleness, Calder loved the drama and chaos of the circus - simultaneous acts, overhead wires, shifting spotlights, the staging of the spectacle. He created a body of work that describes its virtual volume by moving through the viewing space; he took sculpture off the pedestal and presented his works as actors in a 'theatre in the round', where there is no fixed viewpoint and no frontal presentation. The circus may also turn out to be the most useful metaphor yet for thinking about exhibiting Calder - understanding the exhibition space as an expanded stage, with some actions occurring overhead and others within the floor-space. The exhibition needs to strike a careful balance between moments of drama and those of contemplation, to focus the spotlights (both literal and metaphorical), to compose the motions, and to choreograph the production in ways that do justice to Calder's extraordinary body of work.